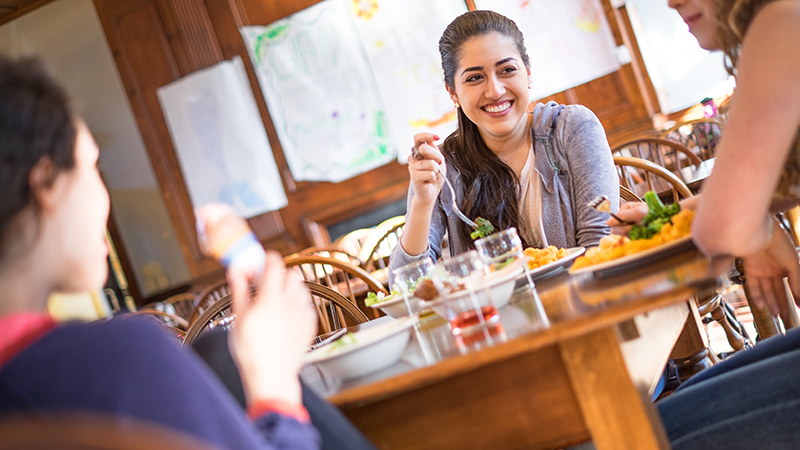 Smith College Dining Services is committed to providing outstanding customer service and the highest quality food to all students and guests. We embrace Smith’s traditions while keeping current with global dining trends. We support our community by sourcing our food from local farms and businesses. With 15 dining rooms on campus, Smith offers many options and plenty of flexibility and variety, including a kosher and halal menu. We make every effort to accommodate vegan/vegetarian and special dietary needs whenever possible. Dining Services is delighted to provide meals throughout Commencement weekend. See the menus for Commencement Lunches. Students in Jack Loveless' Mapping Our World: Introduction to Geographic Information Systems course are conducting two projects with Dining Services—one to map where Smith's food suppliers come from, and another to investigate how Smith can enhance its composting efforts. Read the Gate article. Smith has a handy Grab & Go reusable container program. Learn more about how it works. Sidehill Farm's organic yogurt comes from cows that freely roam the farm's pasturelands in Hawley. Winter Moon's organic root vegetables thrive inside thanks to electricity drawn entirely from solar panels. Berkshire Mountain Bakery’s artisanal breads incorporate traditional baking methods and a reverence for nature. Smith College Catering can assist you with your special events, from coffee breaks to dinners to receptions. The Campus Center Café offers a wide variety of food and beverages, including pizzas prepared in a stone hearth oven. Dining Services is committed to supporting local and sustainable foods, promoting an environmentally conscious food culture.